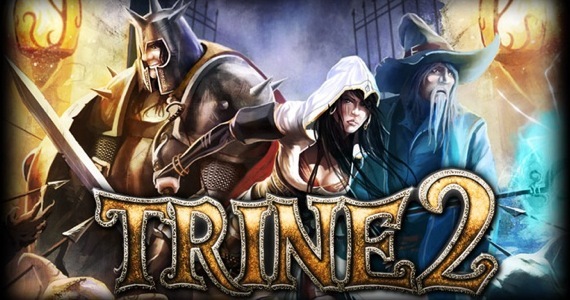 Trine 2 begins with three heroes being drawn together again by the Trine. They are taken to an unknown location where wildlife and plants are mysteriously overgrown and is overrun by goblins. On your journey, you discover the letters between two sisters, one whose personality is changing and the other who is concerned for the other. The three heroes share banter between each other as the had previously and provide some context for the time between the first and second game. Trine 2 is a side scrolling puzzle platformer. You play as three main characters, Amadeus the wizard, Pontius the knight and Zoya the thief. Amadeus can conjure boxes, planks and can manipulate and levitate objects. Pontius wields a sword, shield and hammer excelling in combat and destroying obstacles. Zoya is equipped with a bow and has a grappling hook she uses to swing off wooden objects. You can switch between the three freely without delay. You level up by finding experience in the level and killing enemies. You gain a skill point for the heroes each level and you can redistribute all points at any time. Certain skills, mana and equipment are removed. Treasure chests now contain artwork and poems revealing more about the sisters. The physics are floaty, reminiscent of LittleBigPlanet. You and objects tend to stay in the air for a few moments. Objects and platforms have weight and will tip over an edge. The physics are the basis of some puzzles. Each character has their own methods for fighting but other than a few new skills the fundamentals are unchanged. Trine 2 does add bosses. When a character dies you can switch to any remain character. You can revive characters at checkpoints. Trine 2 has more complex puzzles without giving you new abilities to solve them. Originally, Trine 1’s puzzles were mostly platforming focused. Many puzzles then involved crossing gaps, reaching high ledges or using objects as weights. There were large sections of Trine where you could quickly run through. Frozenbyte has created puzzles with more moving pieces requiring more thinking from the player. You will have to divert water, move portals or attach pipes to redirect wind and fire. Trine 2 is flexible enough to have multiple solutions to most puzzles. There are elegant solutions and there are messy solutions, very messy solutions. There is offline and online multiplayer that allows each player to control one of the three heroes. If you are playing with two players then you can switch to the standby character. All players share the same screen and players can be left behind. The camera may not always follow the furthest character leading you to walk in to any dangers without you seeing. This mode can become hectic as some characters are more effective in certain situations than others. The graphics in Trine 2 are detailed and the use of vivid colors and lighting makes are impressive. The backgrounds are lush and beautiful as they make the world feel large even though you move left and right. The attention of detail is outstanding when the developers could have cheated and repeated scenery and objects all throughout the game. The main theme is a soft medley that is well orchestrated and memorable. The soundtrack has a lot of ambient music, more orchestrated medleys that pick up in tempo when it needs set the mood. Trine 2 has become more of a puzzle game than a platformer. The puzzles make the game feel longer and admittedly I took a lot of brakes before I beat the game. You can easily be distracted trying to get an out of reach experience vial or find multiple solutions to a puzzle without realizing. I am disappointed by the removal of the equipment and some of the skills because they weren’t replaced with anything. It feels lazy that the new skills are all combat focused. Most puzzles revolve around the wizards levitation but the thief out of anyone could have a new puzzle related ability. Trine 2 is a well designed game that has a good balance between puzzle, platforming and action. Braid and Limbo, two other downloadable side scrolling puzzle platformers have good puzzles but lack the flexibility and fast paced action which is why I am more fond of the original and the sequel. The game looks and sounds great and playing with other people can be enjoyable. While there wasn’t anything significant added to the game the focus on improved puzzles and combat is enough. The game is $15 but after see the work put into the game is well worth the purchase.